On Sunday July 5, 2009 a memorial service was held at Medgar Evers College to honor the passing of a great figure in the Westindian Panamanian diaspora living in New York, Dr. George A. Priestley. A descendant of the Silver People, whose strength, wit and perseverance was indispensable in the construction of the Panama Canal, he reflected that sterling character in his many achievements throughout his life that made a difference in the lives of many who came in contact with him. 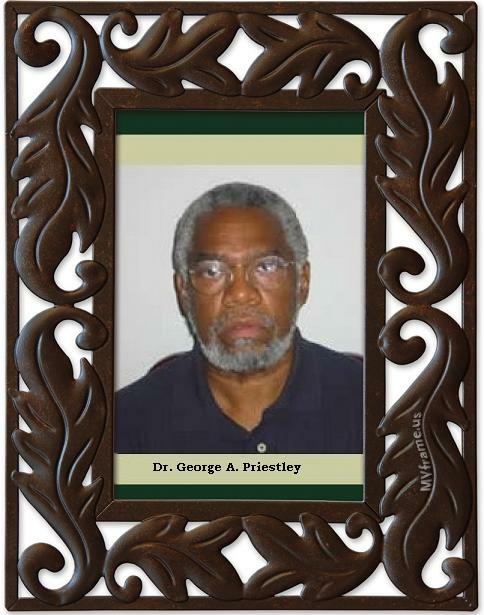 George Priestley was born in 1940 in Wachipali (District of Marañon) in Panama City to parents of Barbadian origins. He attended primary school in Escuela José De Obaldía in Calidonia and went on to continue his education in La Escuela Arte y Oficio, a vocational secondary school. A diligent and resourceful student, he was granted a scholarship and enrolled in the Instituto Panamericano, a prestigious secondary school from which he graduated with honors. Before long he joined the migration north of thousands of Westindian Panamanians with the desire to better his life and continue his education. George graduated from Brooklyn College in 1968 and had received both his Masters and his Ph.D. degrees from Columbia University by 1980. He also completed some of his graduate study work in Lisbon, Portugal. He served as Director of the Latin American and Latino Studies program at Queens College for many years and taught in the Political Science Department at that institution for a total of 40 years. He also served as adjunct Professor in the Department of Pan-African Studies at Barnard College/Columbia University. Dr. Priestley played an important role in mobilizing support in the United States for the passage of the 1977 Torrijos Carter Treaty which effectively won for Panama national sovereignty over the Panama Canal after seventy five years of U.S. control. As we all know on December 31, 1999 the terms of the Treaty were fulfilled in the complete reversion of the Canal and its territories to Panamanian hands. His involvement in the issue of race and racism, an issue very dear to his heart, an issue which he grew passionate about since his childhood in Calidonia, became one of his key driving ambitions. He was, in fact, a key facilitator of the dialogue on race in Panama and its challenges amongst the Afro-Antillean population in the U.S. He was also a facilitator in Panama’s participation in the World Conference on Racism in Durban, South Africa in 2001. Dr. Priestley served on a number of academic and editorial boards including NACLA, the North American Report on the Americas, and Tareas, one of Panama’s leading Social Science journals. He was a contributing editor of Wadabagei, a Journal of Caribbean Studies and its Diaspora and he worked as senior researcher at the Justo Arosemena Center for Latin American Studies (CELA) in Panama where his research interests encompassed a broad range of topics, including Comparative Politics, Central American Politics, Comparative Racial Formation, and Transnational Identities in the Black Diaspora. He has authored or co-authored several books, monographs and a multitude of articles on the topics he was so passionate about. The following are just some of his more outstanding writings. * Panama‘s Political Crisis: Is There a Democratic Alternative? * Piel Oscuro: Ensayos y Refleciones al Filo del Centenario– published in 2003 and co-written with long time friend and collaborator Alberto Barrow. He also edited and wrote the prologue to Mr. Barrow’s 2001 book, No Me Pidas Una Foto: Develando el Racismo en Panama, an exposition on the many facets of racism in the Republic of Panama. Since the decade of the 1970’s he had established a close professional relationship with the noted sociologist, poet and film director, Gerald Maloney, Director of the “Armando Fortune” Research Center for Afro-Panamanian Studies. More recently he became involved in research projects covering the transnational identity of the Panamanians of Westindian ancestry and he initiated a political biography of George Westerman, journalist, diplomat and defender of the rights of minorities in Panama. As Director of the Afro Latino Project, an initiative largely supported by the Ford Foundation, he coordinated the work of a team of social science professionals from the Dominican Republic, Honduras and Panama, who work to determine the impact of the HIV-AIDS in the black populations of those countries, and the formulation of public policies and actions that would address this important subject. Dr. Priestley has been the recipient of numerous awards including a Gulbenkian Fellowship, a Ford Foundation Diversity Initiative Grant, a Mellon Foundation Award, a National Endowment for the Humanities/Schomburg Center for Research in Black Culture Fellow 2002-2003, a 2008 honoree award by the NAACP-North East Queens Branch and numerous grants from PSC-CUNY. Beyond academia George Priestley occupied numerous positions, including the Vice-presidency of the Third Black Cultures Congress of the Americas (Sao Paulo, Brazil, 1982), the Presidency of the Panamanian Black Congress (Panama, 1988), and Co-coordinator of the Panamanian Committee against Racism. The Observatorio Panamá Afro, a research and advocacy initiative motivated by Dr. Priestley is pending formalization, will carry his name In Memoriam. His life’s work has carried him to the far corners of the world and although he resided in the United States for more than forty years, he chose not to become an American citizen and assumed the civil limitations that accompanied this decision. He was 68 years old and is survived by his loving wife of over 40 years, Mrs. Marva Wade Priestley, and his loving son Amilcar Maceo Priestley. Let the life of one of our tireless scholars, Dr. George Priestley, serve as an open book for all of us to study. Click here to visit his memorial. This entry was posted in Notable Panamanian West Indians and tagged Afro-Latino Project, Calidonia, CUNY, etnia-negra-de-Panamá, George A. Priestley, Queens College. Bookmark the permalink. I was one of Dr. George Priestley’s students in the late 1990s. He was not only a great teacher, he was my mentor, advisor, and friend. Dr. Priestley recognized in me what I didn’t recognize in myself. He encouraged me to study hard and work towards my lofty goals. He taught me that no hurdle was to high for me to jump. He never ceased to give support to his students who had a hunger for learning and provided sound advice and enouragement when needed. It was always such a pleasure to come to his night class, even after a hard day’s work. And as the night wore on he would stay after class and talk to his students about World Politics and what he thought World Leaders should do to make this world of ours a better place. Dr. Priestley – you are no longer with us, but this world is truly a better place because of your scholarship and generosity. I am in deep regret for procrasinating to visit you on campus. Only you would have understoond the shock and grief I felt when I heard of your passing. Too soon too soon. I miss you very much. May your wife and son be comforted with the knowledge that you were in a league of your own and there will never be another Dr. George Priestley. May God Keep You In The Palm of His Hands. Professor Priestley was not only my mentor that showed me the role of the scholar in the struggle for social justice, his personality and passionate dedication to his work were an example of how to make the world a better place. I will always remember Professor Priestley. We count on many of our loyal readers for background information and even photos on many of these wonderful people since information on them is very scarce on the Internet and/or anywhere else. If you or anyone has more info on particularly the women athletes please contact us. Many thanks to George Priestley, I am honored and blessed to have known him. This is lovely and indeed very nice . Muy bien en honor al Dr. George Priestley. I always consulted with him when I had papers to present while I was in Graduate school. I also always attended many of the conferences that he organized. A few times he had invited me to present papers at some of his conferencs but I was always too busy. I regret not finding the extra time. George Priestley was also the type of person one could have a nice intellectual conversation with and he would leave you with so much food for thought , not wanting to end the conversation. I am talking about topics on world and current events. He was very honest in his analysis which was quite inspiring. The memorial service was also beautiful. El Profesor Priestley ha dejado un legado realmente bello .